Walter Schreifels really loves music, and it shows on Run To Be Born, the former leader of Gorilla Biscuits and Quicksand's and the current frontman of Rival Schools' latest endeavor. Sounding most like the latter project mentioned, Walking Concert is Schreifels' moving tribute to The Beatles, The Beach Boys, and indie rock, with all of the elegance and acumen you'd expect from such a seasoned pro. Short, stinging pop tunes with startling depth and dazzling songwriting, tracks like the laconic "Girls in the Field" lull you away to a place where fluffy clouds rest in the sky, while "Mustang Ford" kicks out the jams like a vintage garage rock band from 1968. Wanna see yet another side to this musical juggernaut? 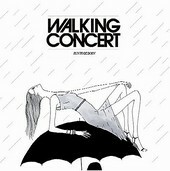 Check out Wallking Concert and enjoy the sunshine.